Opening times: Open 24 hours per day. 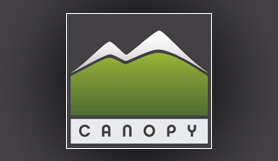 Canopy Airport Parking is the latest off-airport parking alternative to parking at Denver International airport parking lots. Offering professional and convenient valet parking service as well as self drive. Free shuttle service from your individual vehicle to DIA 24 hours on brand new biodiesel, CNG, and hybrid shuttle buses. Complimentary luggage assistance. Shuttles run every 6-8 minutes. Open 24 hours per day. New 4200 space luxury parking with 2700 Open Air parking space. Shuttles run every 6 8 minutes. Covered Parking to protect the car from adverse weather conditions. Upon arrival get ticket at gate and follow signs to indoor valet parking, covered self park and open air parking. Pick-up is outside Baggage Claim area. Please go to shuttle pick up. When you check in your vehicle, you will receive complete details regarding your return to the lot. If you usually take I-70 Eastbound to the Airport take the Peña Boulevard exit from I-70. Continue on Peña for approximately 5 miles to Tower Road. Exit Peña at Tower Road, and turn left at the stop light at the bottom of the off-ramp. You'll make a right turn at the stoplight to aAnopy Airport Parking, which is located on the East side o fTower Road just North of Peña. If you usually take E470 Southbound to the airport, use Exit 31 from E470, 96th Avenue. Turn Right (West) on 96th Avenue and continue to Tower Road. Turn Left on Tower Road and continue south to Canopy Airport Parking. Canopy Airport is on the East side of Tower Road. You'll make a Left turn at the stoplight into Canopy. If you usually take E470 Northbound to the airport, use Exit 28B, Peña Boulevard Westbound. Exit Peña Boulevard at Tower Road and turn right on Tower Road. Canopy Airport is on the East side of Tower Road. You'll make a Right turn at the stoplight into Canopy. If you usually take I-70 Westbound to the airport, exit I-70 at E470 Northbound. Depart E470 at Exit 28B, Peña Boulevard Westbound. Exit Peña Boulevard at Tower Road and turn Right on Tower Road. Canopy Airport is on the West side of Tower Road. You'll make a Right turn at the stop light into Canopy. If you use 104th Avenue to reach the airport, take 104th Avenue East to Tower Road. Turn Right (South) on Tower Road. Continue South 2.9 miles on Tower Road to Canopy Airport Parking. Canopy Airport is on the East side of Tower Road . You'll make a Left turn at the stop light into Canopy.